Attracting skilled foreign workers has become a high priority for countries seeking to be economically competitive, but their methods for doing so vary. Since entering office, President Trump has called for the United States to adopt a more “merit-based” system, looking to Canada and Australia as potential models. In demand-driven immigrant selection systems, including the one in place the United States, employers choose the workers they need to fill existing vacancies, and the government screens them to ensure they are eligible for admission, as well as to prevent fraud and enforce security protocols. By contrast, countries such as Australia, Canada, and New Zealand use points-based systems in which governments take the lead, selecting among prospective immigrants based on labor and human-capital considerations, including professional experience, education, holding a job offer, and destination-country language proficiency. Looking ahead, the report offers recommendations for policymakers charged with managing immigrant selection systems in a time of labor-market and demographic change. These include ensuring that selection systems are flexible and responsive to changing conditions, studying newcomers’ integration outcomes to inform future admissions criteria, and finding ways to not only attract but also retain skilled foreign workers. II. 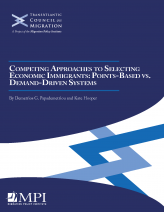 How Do Demand-Driven and “Merit-Based” Systems for Selecting Immigrants Compare?